If you were flying inland over Antarctica’s Princess Elizabeth Land and peering out of the window of your plane, you wouldn’t find much variety to the scenery. 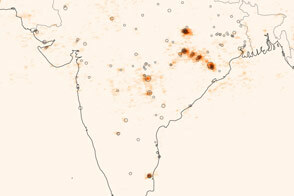 There are no forests, no meandering rivers, no soaring mountains. What you would see instead is a seemingly endless, flat expanse of wind-blown snow and ice—the surface of one of the thick ice sheets that shrouds most of Antarctica. But if you happened to be passing over the south geomagnetic pole, you would see a cluster of buildings and equipment scattered on the ice surface. 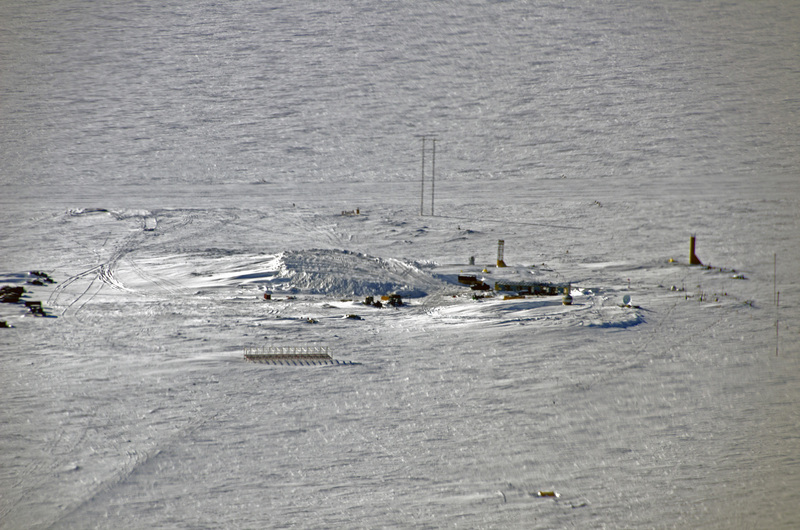 This is Vostok Station, one of the most remote research stations in the world. Established by the former Soviet Union in 1957 and now operated by Russia, the station is located about 1,300 kilometers (800 miles) from the geographic South Pole on top of approximately 3,700 meters (2.3 miles) of ice. During the summer research season, Vostok Station supports about 30 people. An airborne camera, the Digital Mapping System (DMS), captured this image (top) of the station as NASA’s P-3 was flying over on November 27, 2013. The DMS camera, which was mounted on the bottom of the airplane, was at nadir when the image was taken, meaning it was pointing directly down at the surface. 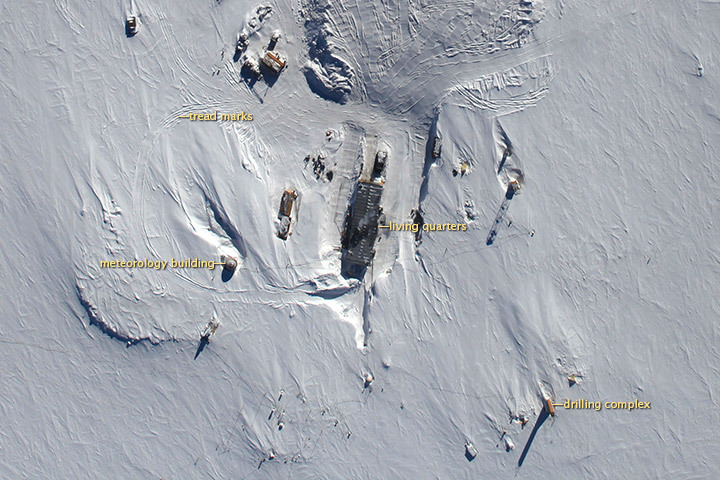 A number of features were visible from the plane’s 1,500-feet (460-meter) cruising altitude, including drilling equipment, communication towers, and the station’s meteorology building. The plane was surveying as part of Operation IceBridge, a multi-year mission to monitor conditions in Antarctica and the Arctic until a new ice-monitoring satellite, ICESat-2, launches in 2016. While the primary objective of Operation IceBridge is to collect information about the thickness of ice sheets with laser altimeters and radar sensors, the DMS acquires high-resolution natural color photographs that scientists can use to monitor conditions at the ice surface. On most flights, IceBridge project scientist Michael Studinger brings his own digital camera as well. 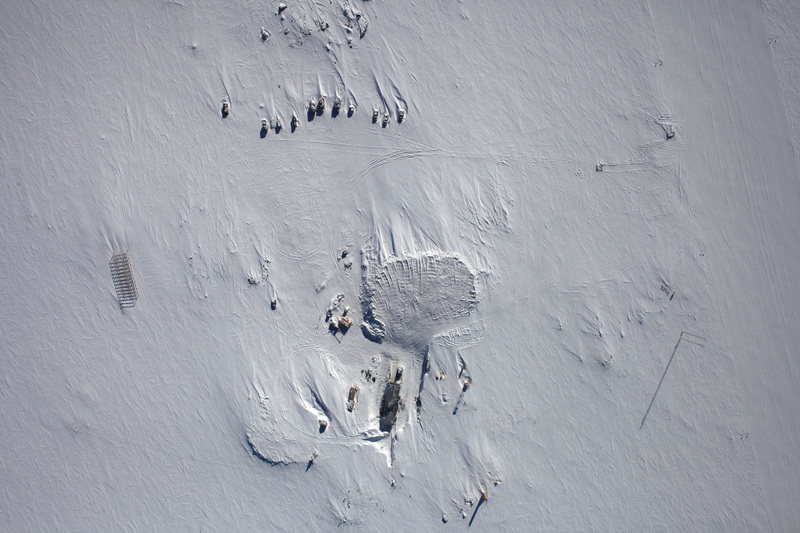 Studinger took the bottom photograph as the plane approached Vostok Station. Before taking over the leadership of Operation IceBridge, Studinger was involved in a project to study Lake Vostok, a massive subglacial lake deep beneath the station. 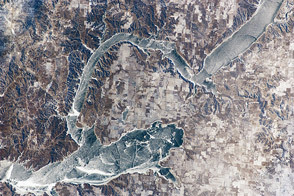 The lake, discovered in 1996 with a radar on the European ERS-1 satellite, is about the size of Lake Ontario and has been covered by ice for up to 25 million years. 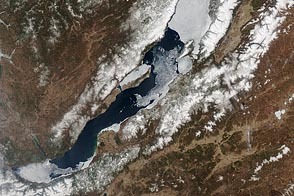 A Russian team succeeded in drilling all the way down to the lake in 2012 as part of an effort to study microbes living in the lake. NASA Earth Observatory image, using data from the Digital Mapping System (DMS) acquired during an Operation IceBridge flight. 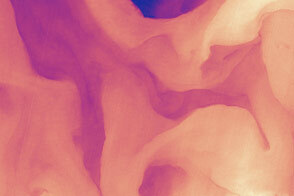 Oblique photograph courtesy of Michael Studinger, NASA Goddard Space Flight Center. Caption by Adam Voiland. A camera aboard a NASA aircraft snapped this picture of Vostok Station as it passed over the remote Antarctic outpost during a surveying flight in November 2013. New York Times (2012, February 8) Russian Scientists Bore Into Ancient Antarctic Lake. Accessed December 19, 2013. Columbia University Subglacial Lake Vostok. Accessed December 19, 2013. Nature (2012, February 14) Russians celebrate Vostok victory. Accessed December 19, 2013. 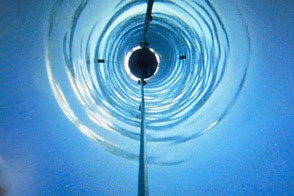 Wissard Whillans Ice Stream Subglacial Access Research Drilling Project (2012, December 21) Polar Science is Cool. Accessed December 19, 2013. 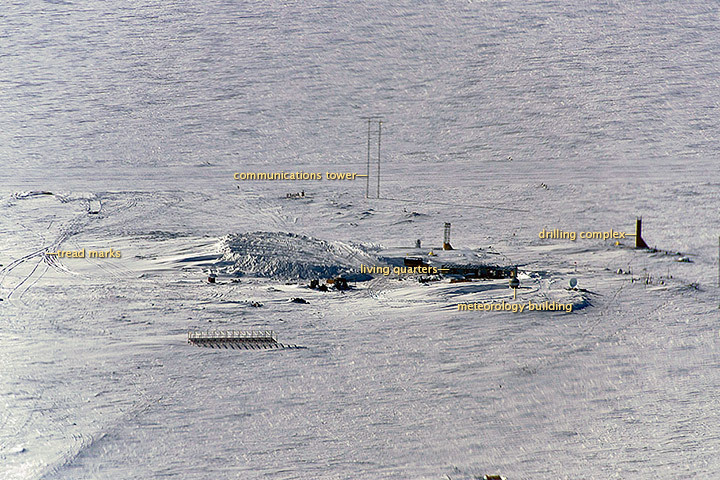 South Pole Station Lake Vostok Drilling Project. Accessed December 19, 2013. Russian Antarctic Expedition Station Vostok. Accessed December 19, 2013.